Heartburn is a burning sensation behind your breastbone that happens when your lower esophageal sphincter, which is normally a one-way door from the food pipe into the belly, relaxes enough to let stomach acid seep up into the esophagus. Wearing tight-fitting clothes, smoking and eating big meals can worsen heartburn. Maintaining a healthy weight and following a healthy diet can improve symptoms. Vegetables play an important part in weight management to minimize your heartburn symptoms, but some vegetables can exacerbate this condition. Some vegetables can worsen heartburn. Onions, garlic, broccoli, cauliflower, cabbage, tomatoes -- technically a fruit -- and mint are major culprits. Since fatty foods make your stomach produce more stomach acid, eating french fries or zucchini drenched in butter can bring on a bout of heartburn. Adding acidic condiments such as cider vinegar and ketchup to your meals will only make matters worse. Vegetables contain a lot of fiber, which mixes with water in your stomach, making you feel full on less food. This effect can be helpful if you are trying to lose weight, but it can also produce an over-full feeling in your belly, stretching out the tissue at the top of the stomach and possibly relaxing the lower esophageal sphincter to release acid. Eating smaller meals can help relieve the pressure on the sphincter. Vegetables are an important part of any balanced diet and can be good sources of antioxidants, vitamins, minerals and carbohydrates. Replace processed foods with steamed, microwaved, roasted or raw vegetables to avoid adding more acid-inducing fat to your diet. According to Heartburn Stop, colorful vegetables contain enzymes that help break down food. Everyone's heartburn triggers are different. Keep track of the foods that make your heartburn worse and avoid eating them. Foods that incorporate vegetables that frequently trigger heartburn include french fries and chili slaw dogs. Avoid acidic vegetable foods, including tomato sauce and pickles, and the condiments that often accompany veggies, such as salad dressing. Cooking vegetables before eating them breaks down fiber, which makes vegetables more digestible. If spicy vegetables like peppers and onions give you heartburn, choose milder ones like celery and sweet potato. Heartburn Stop: Can Vegetables Cause Heartburn? 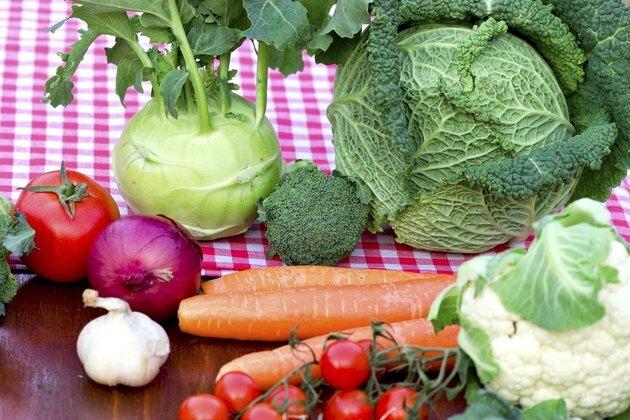 What Vegetables Can You Eat if You Have GERD?